While there’s no need to hunt out romance in Hawai‘i, plate lunches and shave ice for every meal may not do the trick. Instead, check out these RESTAURANTS for a view, good food and a perfect place to FEED THE FLAME. BROWN’S BEACH HOUSE: What better way to rekindle that spark than being surrounded by tiki torches and palm trees right along the beach? Brown’s Beach House offers the IDEAL SUNSET MEAL, pairing outstanding Hawaiian fare with a stunning view and outdoor seating. Location: The Fairmont Orchid, 1 N. Kaniku Drive, Kamuela. 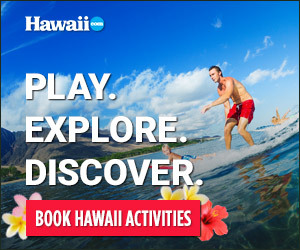 (808) 887-7368, fairmont.com. KEEI CAFE: With hardwood floors, wood tables, local paintings—oh, and windows that look out onto the ocean—the ambiance of this SMALL, FINE-DINING RESTAURANT is sure to charm. Keei Cafe is known for its seafood and delicious local desserts, as well as its overall atmosphere. Even better, the menu won’t break the bank. Find them by mile marker 113 on Highway 11 in Captain Cook, near Kona. Information: (808) 322-9992 or keeicafe.net. ‘ULU OCEAN GRILL + SUSHI LOUNGE: Casual island elegance surrounds diners here as they indulge in the restaurant’s signature “R.S.A. : Regional, Seasonal and Artisanal” cuisine. The key word here is “SUSTAINABLE DINING,” as a large portion of the menu is sourced from Hawai‘i Island. With a cozily lit lanai overlooking the ocean, this is the perfect place for an evening meal accompanied by soothing trade winds and a view of the stars. Location: Four Seasons Resort Hualalai, 72-100 Ka‘upulehu Drive, Hualalai (North Kona Coast), (808) 325-8000, uluoceangrill.com. 2. If you’re looking for a sunset view, find out what time the sun will set before making a reservation. 3. Ask for beachfront seating, if possible.